The brothers of the Pi Kappa Phi Fraternity at Troy University wanted to make a good thing better. And, if numbers and smiles count for anything, then the Pi’s made better, the best. 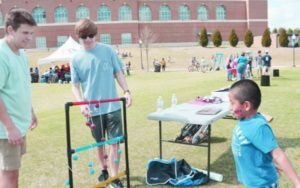 The Pi Kappa Phi hosted a Carnival for special needs students from Pike and surrounding counties Thursday at the Troy University Arena field area with more than 180 kids participating. “Last year, about 40 kids participated,” said Travis Ratliff, event chair. 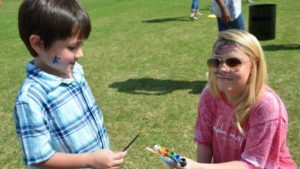 “The kids had a great time and we wanted more kids to be able to participate this year, so we opened the Carnival up to schools outside Pike County. Ratliff said other Greek organizations, university clubs and civic clubs are invited to participate. The games were designed after old-time carnival games, such as “Go, Fish” and “Ring the Bottle” but also included skill games, face painting and “Pie a Pi” which was “the most fun” because kids got to actually put a pie in the face of a member of the sponsoring fraternity. But Vincent Elio, Pi Kappa Phi president, said it’s worth a pie in the face to see the smiles on the kids’ faces. Beth Chancellor, Pike County Elementary School teacher, agreed.